Photo Slideshow Creator makes it easy and quick to create a photo slideshow and the result looks as if you took days to create it in a professional editing package. To begin, you need to add photos to the slideshow storyboard and arrange their order by dragging pictures with the mouse. Slides in the storyboard are separated by transition effects which are added to the slideshow automatically. However you can replace default effects with other transitions by dragging them to the storyboard from the library of effects. There are also slide templates that can be used to start or end the slideshow or separate slides that represent different themes. Templates are fully editable: you can add your own background picture, edit default text or add and format your own captions. To add life to the slideshow, you can make use of the Virtual Screen feature and apply a default design template to a picture. For example, photos can be viewed framed on the virtual monitor, banner board, school blackboard and screen of the movie theater. What's more, you can add music files in MP3, WMA WAV and arrange playback order. At any moment of the design process you can preview the slideshow in the built-in player. 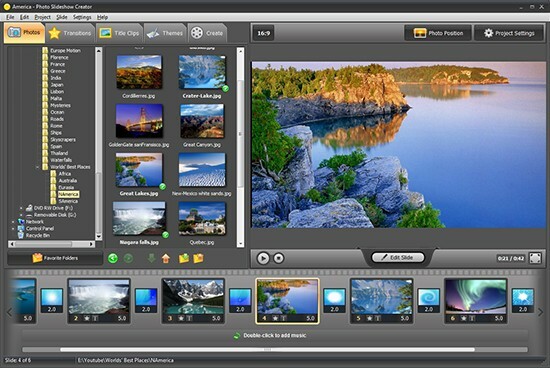 Photo slideshow software offers different output formats. The slideshow can be saved as AVI video, HD video, video for mobile devices like smart phones, iPhone, iPod, PSP, as well as an executable slideshow, and auto-run DVD photo slideshow. The built-in DVD burner lets you burn to disk right from the program. You can also save the slideshow in a variety of Web-friendly video formats for YouTube, Facebook, and MySpace.